It’s natural for humans to try to take credit for our accomplishments. Digital platforms are no different. In fact, they might even be worse. Most ad platforms will try and take as much credit as possible for their role in your digital success. Think of native ad platform reports like Tinder profile photos. They might be showing you a really attractive picture with a cute dog licking their face, but they’re presenting themselves in the best lighting possible, from the best angle and perhaps with a clever little digital manipulation thrown in. In fact, it’s probably not even their dog. Let me give you an example. Imagine you’re running an online store, and you’re trying to drive sales with ad campaigns on both Google AdWords and Facebook. A user sees your ad on Facebook and clicks through to your site. They browse around for a bit but don’t make a purchase. The next day, that same user sees one of your Google ads, clicks through again and spends $50 on one of your products. Now, which platform will take credit for that sale? Facebook, which brought them to your site initially; or AdWords, which they clicked through right before they made their purchase? Typically, under their default settings: both. AdWords’ reporting will tell you, “I generated a $50 sale, you’re welcome!” Facebook’s reporting will make the exact same claim. Neither is telling a total lie. They both had a role in generating that sale, but weren’t 100% responsible. And because they don’t even talk to each other, they don’t even technically “know” that another platform was involved. You see the problem? This problem only gets thornier if you’re looking at cross-platform advertising cost data. (And you absolutely should be looking at cross-platform cost data.) Facebook might tell you, “After you spend $20 on Facebook ads, I generated a $50 sale, so your return on ad spend is 250%!”At the same time, AdWords might tell you, “After you spent $30 on advertising costs, I generated a $50 sale, so your return on ad spend is 166%!”In truth, your hypothetical campaign spent $30 on AdWords and $20 on Facebook for a combined $50 in ad costs, for a $50 sale. That would mean that before accounting for any outside costs, you at best broke even. This is the sad reality: If you’re just trusting the native reporting tools in ad platforms like Facebook, AdWords, Instagram, Bing, Twitter and others, you’re not getting the truth. So how do you stop ad platforms from lying to you? To get to the truth, you need to combine data from every platform you’re advertising on into a single tool for analysis. That way, you can see the total sales generated by your store, the channels that impacted that sale and your actual advertising costs for generating those sales on every platform. When it comes to combining that data for analysis, you have two options: manual or automated data import. You can do this manually. This means that you pick a single time period to grab data for. Then you spend hours logging into every advertising and analytics platform involved with your campaign, downloading the data, formatting it correctly and implementing it into reports, dashboards and/or data analysis tools. There might be times when this makes sense. Maybe you’re just starting out, and you only have a couple of data sources you need to mesh. But once you’ve reached any sort of volume, this turns into a very cumbersome, time-consuming and, to put it frankly, miserable process. How long does it take to do this manually? In our 10 years of experience as a digital agency, anywhere from three to 10 hours for a campaign of typical complexity. And even once you’ve spent that time, you’re only looking at data for a specified time period, and that data won’t be updated until you take another 3–10 hours to manually go through the entire process again. As you can probably tell, this isn’t an option we’re too fond of. Let’s be frank. 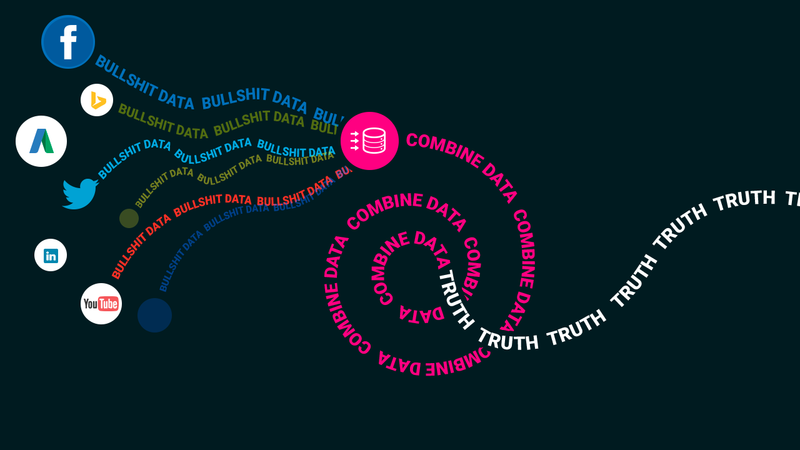 Manually combining campaign data is a huge waste of your time. The much, much better option is to automate the entire process so that you can spend your time doing more important things. (Like giving your cat a bath or solving racism.) Your choice. There are a number of tools that will do this on your behalf, and you can learn more about them in this marketing data import tool comparison. For our money, Improvado.io is one of the best. It’ll connect with just about any digital ad platform on the planet, including AdWords, Facebook, Bing Ads, Outbrain, Twitter ads and a whole host of others, as well as owned platforms like your email marketing software and Google Analytics. It also directly imports e-commerce data from platforms like Shopify and Magento. Most importantly, once it’s set up, it’ll do all this automatically with regular updates, without requiring a single second of your time. Once Improvado.io collects and combines your data, you can either analyze it in a tool like Excel or Tableau, or (our personal preference) use it to create automated reports in a tool like Google Data Studio or Improvado.io’s own in-house reporting tool. The key to a successful digital ad campaign is making sure that it’s supporting your actual business goals. Is it driving sales? Are those sales coming at an acceptable cost? Is there a problem? Is there room for improvement? Without importing data from every platform you’re using and combining it into a single report, you can’t accurately answer these questions. And if you can’t accurately answer these questions, you can’t run an effective digital campaign. So, stop listening to the lies and exaggerations of your native ad platform’s reports. Get all your data in one place so that you can dig down to the truth of your digital campaign’s performance. It’s an essential step in making any cross-platform digital campaign a success. Andrew Hohen is media director for Echo-Factory, where he works to develop digital campaigns that support the business goals of the agency’s clients. In his free time, he enjoys complaining about all the terrible music that the kids are listening to these days.